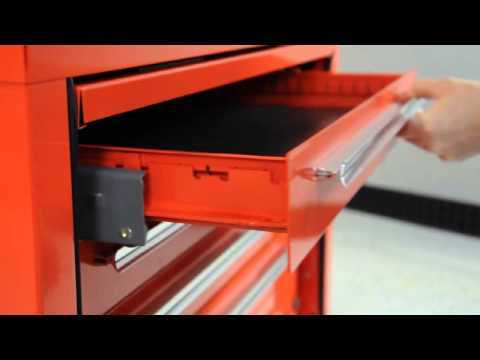 Proto just came out with a new tool chest that allows professionals to organize and store their tools on the jobsite. Their 34-inch Service Road Box might look like your typical garage tool chest at first glance, but unlike your average tool chest, it is strong enough to handle serious jobsite abuse. Except for the drawers, the Proto 34-inch Service Road Box is probably more similar to a jobsite gang box then it is to a tool chest. It is constructed out of a heavy gauge steel and features removable fork lift skids, and 1,200-pound hinge handles for hoisting. Behind a gasket sealed locking drop front are five drawers featuring 400-pound drawer slides and lock-in and lock-out mechanisms. Like I said, it is heavy duty. The Proto Service Road box is 34-inches long, 23-inches high, and 24-inches deep with a total capacity of 6,369 cu. In.